Today I obsessed over my knit edge technique. This was caused by a new upcoming video that I'm going to do about unknitting. Unknitting the Ks and Ps are simple really; it's the edges that cause all the problems. So I pondered once again, "How to knit a neater edge?" A neater edge in most people's opinion is called a Slip Stitch Edge or an Open Slip Stitch Edge, which creates a cool looking chain effect on the edges rather than the bumps you get if you knit all stitches of garter stitch pattern and in stockinette where you knit all right side stitches and purl all wrong side stitches without consideration for what is happening to the edges. Some quick abbreviations to limit my typing. SL = slip one stitch. You do not actually work the yarn through the loop you are slipping. PW = purlwise or "as if to purl". Bring yarn to the front as if to purl, insert needle as if to purl. TBL = the needle is inserted through the back loop; rather than through the front loop (or leg). That might be it. So what does all this mean and how can you apply it to your knitting? Well, personally I don't like any of the directions where I have to do one thing on the RS row and something else on the WS row. Why? Because I forget which row I'm on and wind up creating a bump in the middle of my pretty chained edge! YIKES, then I have to unknit the edge and twist them the right way. Not worth it IMO. And besides you get just as nice of a look with others that are good for both RS, WS, stockinette and garter. There is something that I learned with all this, and believe me I have a huge pile of little skinny samples I've been doing. And that is that every time I knit something there is always a border edge or a selvage which is usually seed st or garter stitch. Other than straight stockinette there is no time that I can recall the first stitch of a row being a purl. Why is this important you may wonder. Well that means to do a sample I need to knit something with a garter stitch border; or just knit garter stitch. Small steps, but I do learn some things with all this experimentation. 1. Creates an open chain edge in which the yarn is not crossed at all in the chain for both stockinette and garter. While I like this because it keeps the sts perfectly on the sides, I don't like it because the edge looks too loose. 3. 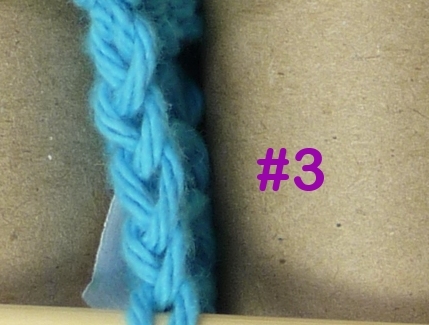 This also creates the twisted chain look, it works on both garter and stockinette, it looks exactly like #2 but there is no tight twisted stitch to knit into. IMO this is the best bet. I did investigate into the mystery of the chain edge once a long time ago and much to my delight I havebeen slipping the the first stitch knitwise and purling the last, which is exactly what I've just suggested. Yeah! Now you wonder, what do you do if your pattern if it doesn't already tell you to slip stitches? Ah this is easy. Simply cast on 2 more stitches than the pattern tells you to cast on. 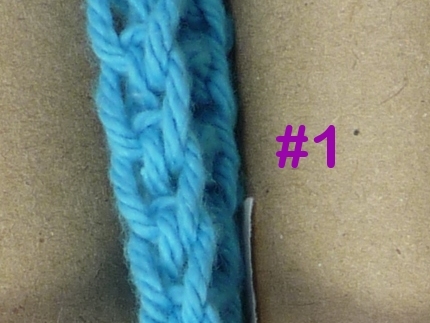 You will SL your first stitch KW, work the pattern in full for that row, then P the last stitch. Simple as pie. Hi there. It took me a while to find a you tube video on how to make a neat edge finishing for scarves and found yours demonstrating 3 options. Thank you for posting. I then looked at your blog and saw the same caring to share your tips and advice. All the best and look forward to more. I found your YouTube video after a google search on "neat knit edges". Im new to knitting and was having trouble deciphering some instructions in a book I purchased. I definitely like your technique better. Thank you so much for posting this very helpful video. Thank you sooooo much. Especially loved the instruction to CO the 2 extra stitches than the pattern tells you, as I had a very jagged- edged shawl, which now can be finished beautifully. God bless you! @Anonymous: Thank you for pointing that out. I had changed my Ravelry user name to DetroitKnitter... it's fixed now. Hope this edge works with your project! I LOVE your concise and precise instructions about edges. You make it perfectly clear how and why to do it each way. My dishcloths and scarves will now look more elegantly finished. Thank you! Thank you very much for sharing this wonderful tip on neat edges! You explain this so nice and easy to understand!!! Love the tutorial here, and the amazing video! I've just read your blog and I have a question. Why would you add 2 sts to your pattern when you are only slipping one? I'm sorry that I don't have a better explanation, but I think if you tried to only add one stitch you would create a bump on one side or maybe alternating sides? Very nice and neat looking, #3 is what I'll be using from now on for visible edges. Thank you so much! I am saving your post. I love #3 and how it works. I am wondering about projects where the leading edge is not stocking stitch but reverse stocking stitch. And I can't get my head around it. Any advice? 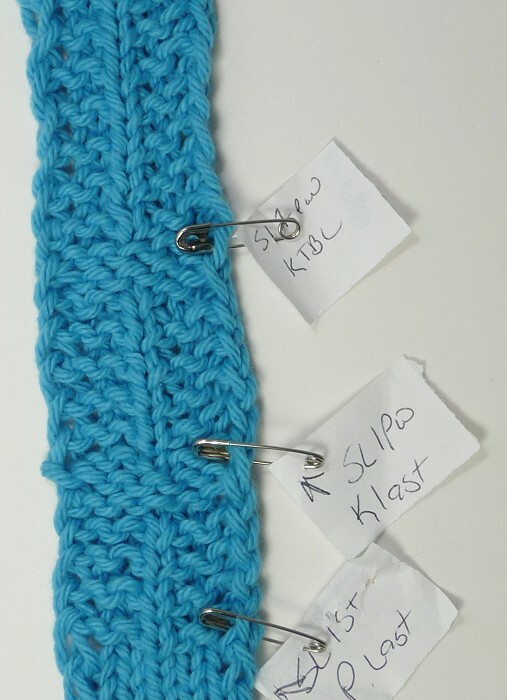 Q: I am wondering about projects where the leading edge is not stocking stitch but reverse stocking stitch. 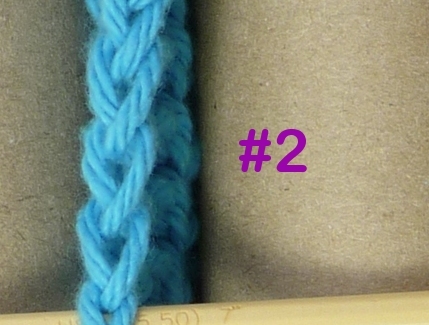 A: You will always add 2 cast on stitches to what the pattern says to cast on in order to make the chain edge. So it doesn't matter which stitch the pattern starts out with. Work the first chain edge then the written pattern and end the row with the chain edge; turn and again work the chain edge stitch then the pattern and end with chain edge stitch and so on for every row. I didn't go into specifics of knitwise/purlwise since that depends on which of the 3 methods you use.